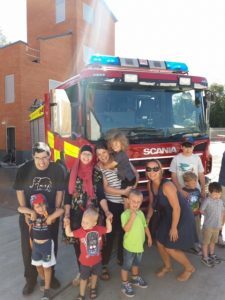 A group of special needs youngsters were given an exclusive tour of Woking’s shiny new Fire Station. Caroline explained that queues, crowds and noise can be very disturbing and overwhelming for children with additional needs, and can detract from the fun they could be having. We-Shine was set up earlier this year by Gemma Evason from Byfleet and is run by a group of volunteer mums who organise activities for the children and provide support. “Parenting a young child with additional needs can be a very daunting and lonely time, and waiting for appointments and support can be frustrating,” Caroline said. “We-shine’s aim is to provide families with parent support and empower them to access services and groups that will help both the family and their child. “We would love to hear from anyone who would be prepared to give us exclusive use of their venue for a couple of hours so our families can enjoy a calm and safe environment for a fun and enjoyable outing.